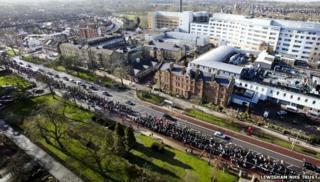 At least 15,000 people have marched in protest against proposals to close services at a hospital in south London. Organisers campaigning to save Lewisham Hospital say the plans are "crazy and ill thought out". The government said "doing nothing is not an option" and is to make a decision on 1 February. Campaigners are angry Lewisham Hospital, which is not part of the South London Healthcare NHS Trust, is being targeted in a re-organisation of services across the area following the trusts's financial problems. Under the plans, the trust's Queen Elizabeth Hospital site in Woolwich would come together with Lewisham Healthcare NHS Trust to create a new organisation. Lewisham's A&E unit would then be downgraded to an urgent care centre, meaning emergency cases would be seen at nearby hospitals. The maternity unit at Lewisham could also be slimmed down, meaning complex cases would be dealt with elsewhere. Matthew Kershaw, a special administrator, said in a report to the government that the trust should be broken up, with other organisations taking over the management and delivery of services. If implemented fully, Mr Kershaw said his recommendations would result in a radical overhaul of services in south London, and help deliver "safe, high-quality, affordable and sustainable services." Mr Kershaw also recommended the Department of Health (DoH) write off any debts to ensure new organisations were not "saddled with the issues of the past". "I have said consistently that the status quo is not an option, and I believe these final, refined recommendations are the right ones, although I appreciate that some people will find them difficult to accept," his report said. In November thousands of people marched in protest at the plans and BBC London reporter Matt Morris said at least 15,000 attended Saturday's event. The Save Lewisham Hospital group said 25,000 took part. Dr Louise Irvine, a local GP and chairman of the Save Lewisham Hospital campaign, said: "This decision is crazy and ill thought out. "It is a big mistake and carries huge clinical risks of things going wrong for patients but also political risk. "If Jeremy Hunt can close a good local hospital here, he can do it anywhere in the country - nowhere is safe." A DoH spokesman said: "Where trusts face long-standing problems we have been clear that doing nothing is not an option." The march went past Lewisham Hospital and ended with a festival in nearby Mountsfield Park.